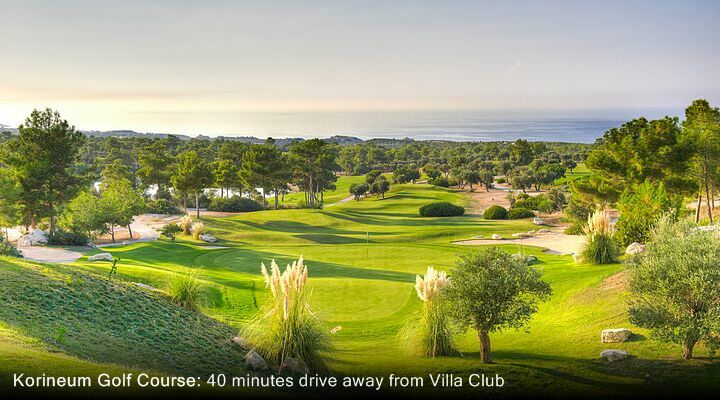 Villa Club Holiday Village is a peaceful family-run group of self-catering villas and studios set in 10 acres of orange and lemon trees. Hosts Mustafa and Alison pride themselves on the fact that most guests come back on return visits year after year. The Villa Club Holiday Village combines the best of a self-catering villa holiday with the friendliness and facilities of a hotel, for a Cyprus holiday that's both flexible and affordable. Choose from in air-conditioned comfort in a studio apartment, with your own fridge freezer for drinks, tea and coffee making facilities, and a pretty little balcony or terrace where you can sit back and enjoy your drinks. The pretty whitewashed mini villas are larger with a kitchenette area and satellite TV, so you can rustle up a snack to enjoy in front of a movie. With pool views from your terrace, you're never far from a refreshing dip or early morning swim. The private villais one of the largest you'll find in a holiday village in Northern Cyprus, with three bedrooms, two bathrooms, private terrace, spacious balcony, and a fitted kitchen. This really is your home from home; relax with a DVD on the TV, cook up your favourite foods in the kitchen, or even treat your sunwear to a wash in your own washing machine. Best of all, each private villa has its own private swimming pool surrounded by lush planting, perfect for lazing and relaxing with family or friends. Free WiFi is available all around the gardens, around the bar and public areas, so even if the signal is a bit weak in your villa, you only need to stroll to the bar to stay connected. 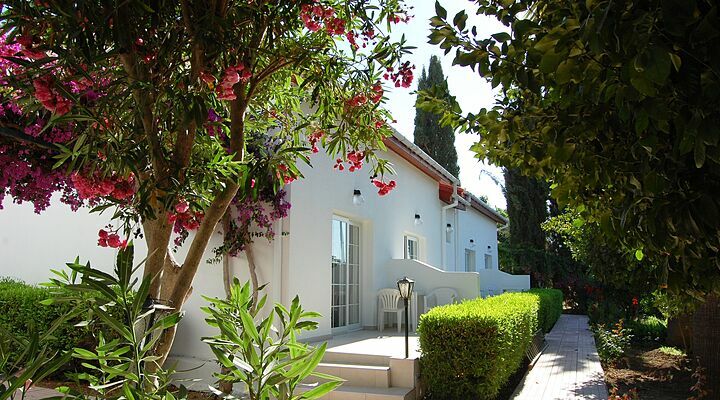 Love the idea of a self-catering villa holiday in North Cyprus? 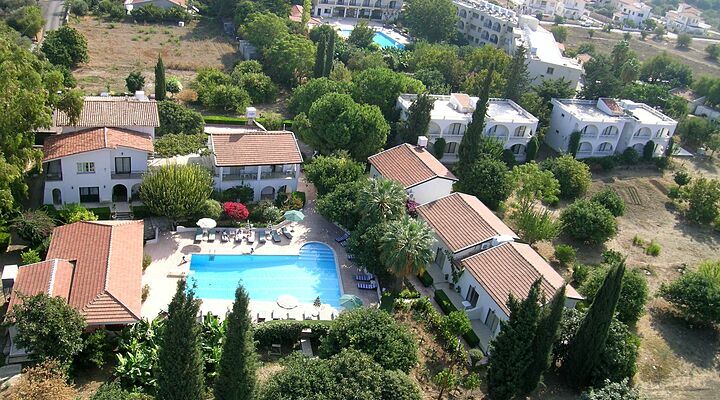 Go North Cyprus holidays are ATOL protected and bonded with the CAA, so you can book with confidence. 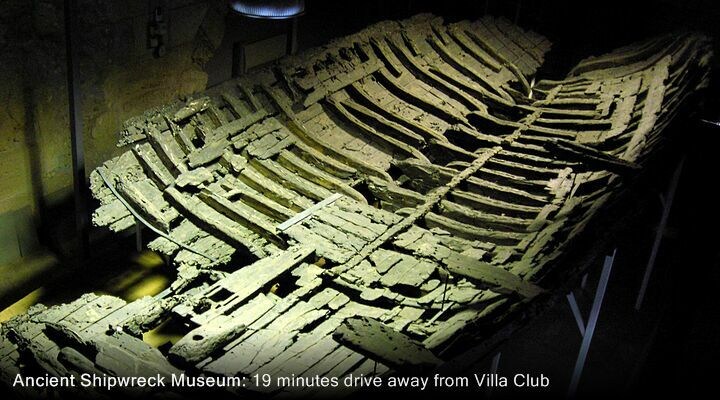 Call us on 0800 612 6600, 7 days a week. 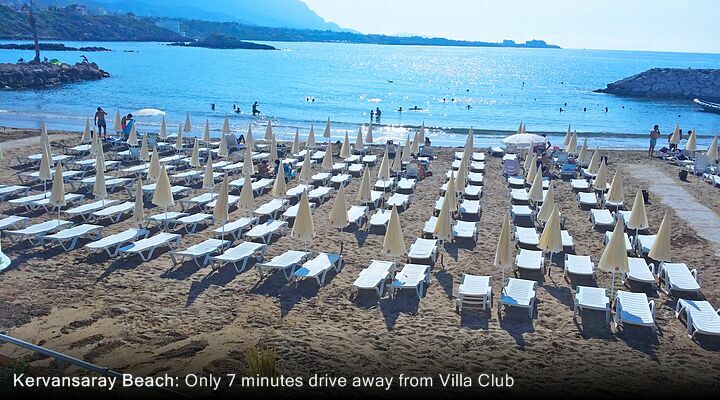 Nestling in the North Cyprus countryside, the Villa Club Holiday Village is a bit of a discovery - one Trip Advisor reviewer described it as "5 * friendly with 2* prices"! Expertly run by owner Mustafa many visitors come back year after year to enjoy the peaceful atmosphere enhanced by the sound of the waterfall fountain. Set amongst citrus groves, you can even pick the fruit to enjoy with a drink or as a healthy snack. With a central swimming pool for all to enjoy, spacious sun terraces, a club bar with sports Tv, and a well-stocked reading room, you can be as social or as quiet as you wish, all holiday long. With the B&B option, tuck into breakfast by the pool every morning, saving you the trouble of making it yourself. Then, choose exactly what you want to eat, when you want to eat, and where. Stock your apartment or villa fridge with tasty treats from one of the two local supermarkets for lazy lunches by the pool, or order lunch from the bar. Wander down into the local village of Alsancak for a delicious dinner at any one of local restaurants, or catch the bus into Kyrenia for open air dining by the harbour side. 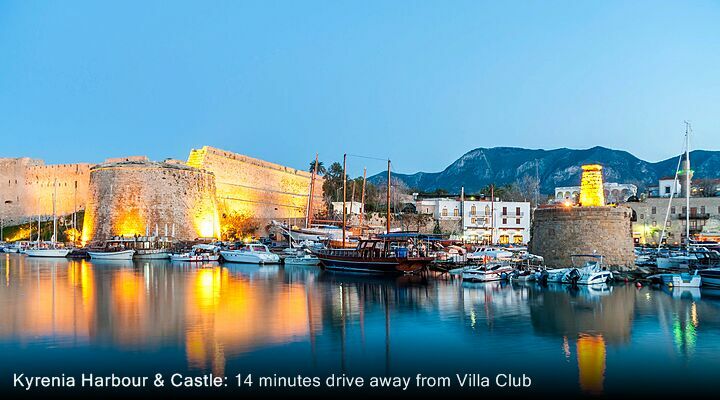 Ask at reception for North Cyprus restaurants that offer a free taxi pick up service. 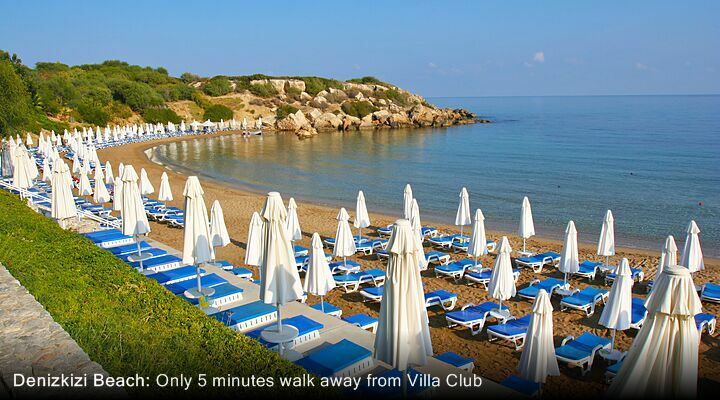 At the Villa Club Holiday Village, you can walk down to two lovely local beaches for a relaxing day by the sea. For a sandy beach, fun in the sun watersports, and all the facilities for a great day by the Mediterranean Sea, head for the Escape Beach Club (entry charges apply). For a relaxing day with a sheltered sandy cove with its own scuba diving school, head for pretty DenizKizi beach just beyond the hotels of the same name (small entry charges apply). Hire a car and you have over 70 beaches to explore in Northern Cyprus, from the amazing sight of nesting sea turtles on karsiyaka Beach during August. When you book your North Cyprus villa holiday here, Ercan International Airport is just 45 minutes' drive away by private taxi transfer, included with your package holiday. Scheduled flights to Ercan Airport North Cyprus are available from several UK regional airports.